Miles Davis’ My Funny Valentine marks several historic turning points. For Davis, the live album represents the final time on record he’d perform standards rather than original compositions. It also stands as one of the last documents made by the same band that created Seven Steps of Heaven. As such, the work teems with bebop melodicism yet steers clear of Davis’ oft-controversial avant-garde leanings. Most significantly, however, the set captures the ballads performed at a benefit concert from New York’s then-new Philharmonic Hall just months after President Kennedy’s assassination. Tapping into a seemingly divine inspiration, Davis never sounded so elegant or poetic. Boasting gorgeous sound and pressed on 180g LP at RTI, Mobile Fidelity’s choice reissue of the trumpeter’s scintillating work bookends the label’s release of Four & More from the same show and features similar enhancements relating to depth, presence, dynamics, clarity, and ambience. Presented in reference-standard fidelity, the record boasts balances, tonalities, and airiness that duplicate the experience of witnessing live jazz in an acoustically ideal hall. The images of each individual instrument, the decay of the notes, the inner reaches of the piano, and symmetry of the horns—all are rendered with palpable detail. This is the very definition of reach-out-and-touch-it realism. Staged as a benefit to support voter registration in the South, the February concert came amidst the height of the Civil Rights movement, a cause dear to Davis’ heart. Yet unforeseen circumstances raised the stakes. 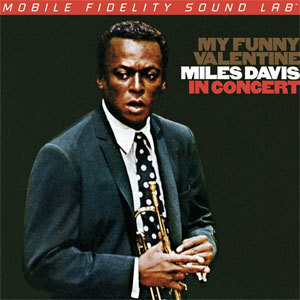 Having professed his admiration for Kennedy years prior, Davis appears to approach the compositions on My Funny Valentine (and, in particular, the title track) as homage to the fallen leader, a collective soliloquy comprised of pieces shot through with deeply emotional passages, spontaneous brilliance, sensitive beauty, and sublime poignancy. Elegiac moods permeate the performances; Davis and his Harmon mute paint with intricate brushstrokes. Pianist Herbie Hancock, bassist Ron Carter, and drummer Tony Williams are their leader’s equal, and would continue with Davis until later in the decade, helping form what’s now known as the “second great quintet.” But the secret weapon on both My Funny Valentine and its sister Four & More arrives in the form of tenor saxophonist George Coleman, whom jazz experts Brian Morton and Richard Cook deem “one of the unsung heroes of modern jazz.” His lines are subtle and sophisticated, straightahead but capable of unanticipated direction, and here, he comes into his own. As does the entire band. Indeed, the combination of introspective chemistry, lyrical reach, and telepathic communication demonstrated by the quintet on My Funny Valentine arguably exceeds that on any of Davis’ myriad other live efforts. One listen confirms something special transpiring, and on this Mobile Fidelity reissue, those properties are rendered in a manner that’s as transparent to the source as humanly possible.